Our Lady’s Chapel at the Elzenveld, site of the opening worship service of the International Lutheran Council’s 26th (11th) World Conference. BELGIUM – The 26th (11th) World Conference of the International Lutheran Council (ILC) opened the morning of September 25, 2018 in Antwerp, Belgium. The event also marks the 25th anniversary of the ILC in its current form. The conference runs until September 28. 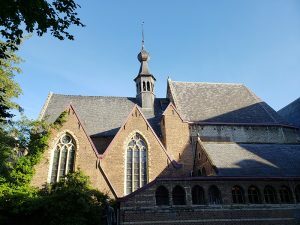 An opening service was held in Our Lady’s Chapel, a fifteenth century chapel of the medieval St. Elizabeth convent (now the Elzenveld Hotel and Conference Centre). ILC Chairman Hans-Jörg Voigt (Bishop of Germany’s Independent Evangelical Lutheran Church) served as preacher for the service, with Rev. Dr. Albert Collver (ILC Executive Secretary) serving as liturgist. Following the service, the ILC received greetings from several local political and ecclesiastical dignitaries, including Antwerp’s Mayor, Bart De Wever; Antwerp’s Vice-Mayor of Culture and Religion, Jan Rombouts; Vicar General Bruno Aerts on behalf of the Roman Catholic Archdiocese of Antwerp; and Chairman John van der Dussen of the Antwerp Council of Churches. Each was presented with a copy of the book 450 Years – Lutheran Church in Antwerp: 1566-1586 and Beyond, a new history by President Gijsbertus van Hattem of the Evangelical Lutheran Church in Belgium. It details in both Flemish and English the early history of Lutheranism in Belgium. The morning of the first day of the ILC’s 2018 World Conference focused on a discussion of the convention theme: “Ecclesiology and Ecumenism.” Dr. Collver introduced the topic, joined by Rev. Dr. Roland Ziegler (Professor of Systematic Theology and Confessional Studies at Concordia Theological Seminary in Fort Wayne, Indiana). In his remarks, Dr. Collver noted that the very first meeting of the group that would become the ILC likewise focused on the topic of church fellowship. The 2018 convention’s focus on ecclesiology and ecumenism is therefore a return to a discussion that has been ongoing for decades. ILC Chairman Hans-Jörg Voigt preaches during the opening service of the International Lutheran Council’s 2018 World Conference in Antwerp, Belgium. Dr. Ziegler continued the discussion, noting that a confessional Lutheran understanding of ecumenism begins first by remembering the unity of Christ’s body which already exists, and recognizing that spiritual reality to be the work of God and not man. From that foundation, he turned to a discussion of the seventh article of the Augsburg Confession, unpacking what it means for the unity of the visible church to be dependent on the Gospel being taught purely and the sacraments rightly administered. Dr. Ziegler outlined four different interpretations of this article, ultimately arguing that agreement on the Gospel and the sacraments includes agreement not only on the teachings of the Confessions but also in all teachings of Holy Scripture. The theme will be further unpacked through three keynote lectures over the next days of the conference. Work in the afternoon was overshadowed in part by the report of a fire in the tower of a Lutheran church in Latvia. ILC Chairman Voigt led the World Council in prayer for the affected congregation and community. The afternoon featured the report of the ILC’s Executive Secretary, who traced the history of the ILC from earlier confessional Lutheran inter-church assemblies in the 19th century down to the present day, where the ILC is celebrating 25 years in its current form. “In 25 years, much has remained the same about the ILC,” noted Dr. Collver in his report, “particularly the ILC’s commitment to the inspired, inerrant Word of God as revealed in the Holy Scriptures and unreserved acceptance of the Lutheran Confessions found in the Book of Concord.” But one thing that has changed, he noted, is ever-growing interest in the work of the ILC by Lutheran churches around the world. ILC Chairman Voigt (left) greets the publication of a new history of Lutheranism in Antwerp, following an introduction by Dr. Guido Marnef (centre). The book was written by President Gijsbertus van Hattem of the Evangelical Lutheran Church in Belgium (right). “Back in 1993 when the ILC was formed, it represented approximately four million Lutherans worldwide,” Dr. Collver noted. By contrast, he said, the current gathering in Belgium “has church leaders in attendance representing around 20 million Lutherans worldwide.” That number includes current member churches, 19 churches currently seeking membership in the ILC, and church bodies represented at the conference which are not yet seeking membership in the ILC, but whose leaders have grown close to the ILC in recent years as a result of the organization’s defense of the authority of Scripture and the Lutheran Confessions. The ILC is expanding its capacity to meet the growing interest and needs of confessional Lutherans around the world, Dr. Collver noted. Some of these initiatives—the formalization of the ILC’s legal status, for example, and the Lutheran Leadership Development Program—will be discussed in greater detail over the coming days. Other business attended to in the afternoon of the first day of the conference included initial votes on the acceptance of new members to the ILC, World Region breakout sessions, and the report of the European World Region. The day’s business closed with Vespers, held in the historic St. Anne’s Chapel (also known as the Emperor’s Chapel), first built in 1512. The church is notable not only for its remarkable Counter-Reformation artwork, but also because it served as a Lutheran church from 1578 until the fall of Antwerp in 1585. President Antonio Reyes of The Lutheran Church of the Philippines preached the sermon, with Rev. Dr. Timothy Quill (Concordia Theological Seminary in Fort Wayne, Indiana) serving as liturgist. The International Lutheran Council is a global association of confessional Lutheran church bodies which proclaim the Gospel of Jesus Christ on the basis of an unconditional commitment to the Holy Scriptures as the inspired and infallible Word of God and to the Lutheran Confessions contained in the Book of Concord as the true and faithful exposition of the Word of God. Every three years, member churches of the ILC and friends gather for the ILC World Conference, where they conduct business, hold elections, and discuss challenges and opportunities facing the confessional Lutheran church around the world.